This Instruction Article shows how to change the document version number from 1 to 0 in LABEL ARCHIVE 2018 (or later) or TEKLYNX CENTRAL 5.0 R2 (or later). This article is to be used only if you want the document number to start from version 0 instead of version 1 in LABEL ARCHIVE or TEKLYNX CENTRAL. This instruction only applies to TEKLYNX CENTRAL 5.0 R2 with PostReleaseFixes_v2 installed. We believe that the procedure described in this article is accurate. However, we make no direct or imply warranty to its accuracy and completeness. Use these instructions at your own risk. Identify the document you wish to change the version from 1 to 0. In this article we will use Test10.lab. Remember the file name. Open SQL Management Studio. Open LABELARCHIVE database and expand Tables. In the dbo.tblDocuments table, right click and select Edit top 200 rows. Modify the SQL statement for the edit by clicking on the SQL button on the toolbar. Look for DOCID for Test10.lab. In this example, it is 1129. 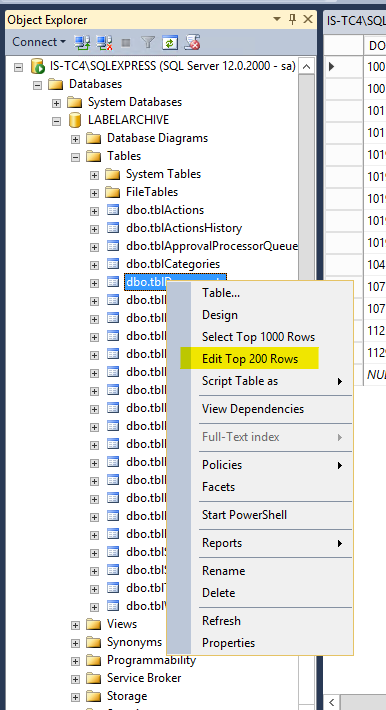 In the dbo.tblHistory table, right click and select Edit top 200 rows. 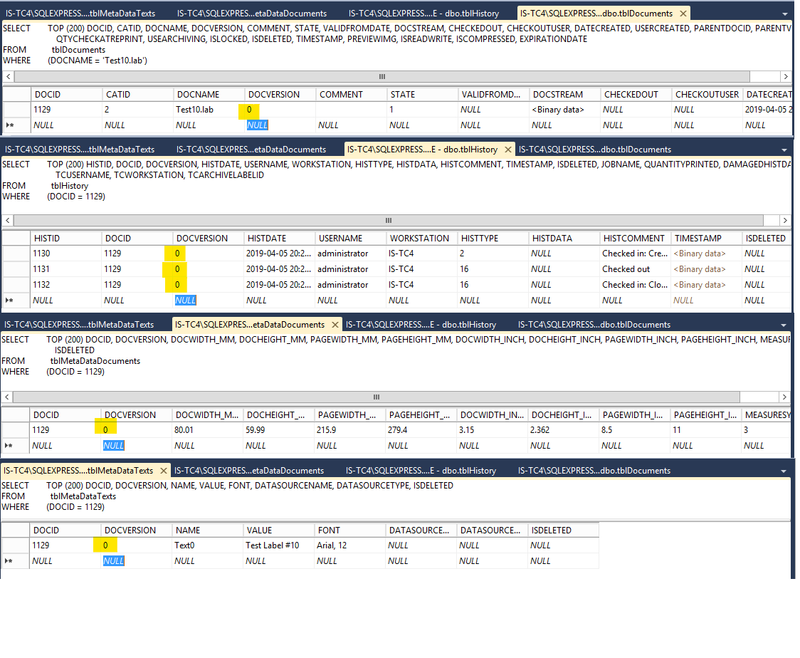 At this point, you should have 4 tabs available in the SQL Management Studio screen. Change DOCVERSION in each of the tabs from 1 to 0. Be sure to press ENTER after each change.